Start by making the dressing. Place half the pomegranate seeds along with the juice in a food processor and blitz. Strain and pour the juice into a small pan. Add the honey and bring to the boil then cook to reduce by half. Place all the other dressing ingredients in a bowl, add the strained pome granate juice and reserved pomegranate seeds, season with black pepper and set aside. In a large, shallow pan, heat some of the olive oil until very hot then add the shredded spring greens and stir-fry for 2-3 minutes. Season with the lemon juice, zest and freshly ground black pepper. Heat a frying pan until quite hot and add a little more of the olive oil. To serve, arrange small piles of spring greens in the centre of 4 warmed plates. 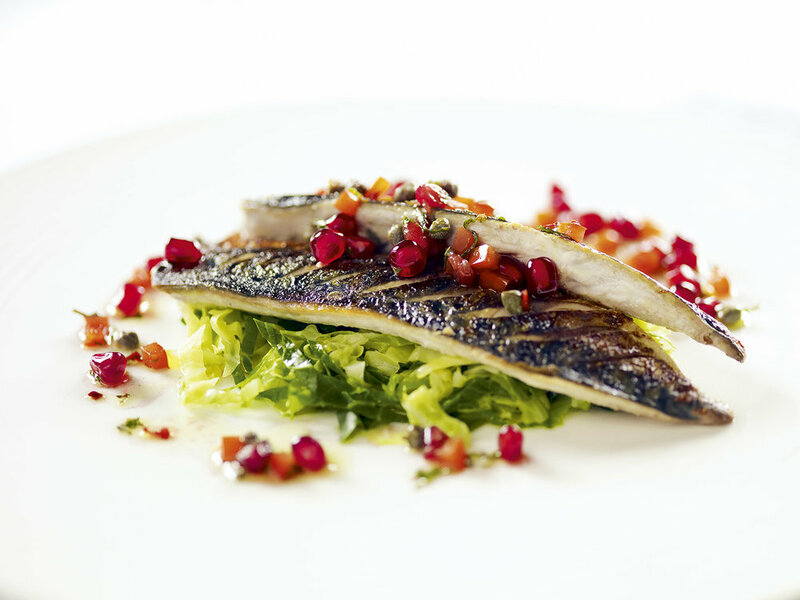 Using a fish slice, place a warm mackerel fillet, skin-side up, on each. Spoon the dressing over and around and serve immediately.